"Between the towns of Hill City and Rabey, along the rail line, were the towns of Brauer and Washburn. My mother taught school at Rabey and she spoke of those towns often. Rabey is on the map in the book "Beyond the Circle" by Leo Trunt. I had the pleasure to work with him on his book." 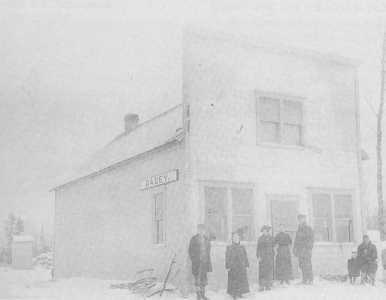 The village of Rabey got its start with the advent of the Mississippi, Hill City, and Western Railway Company's birth in 1908. Prior to that time, the village site of Rabey was low-lying ground and mostly swamp land. there is little evidence of any previous habitation either by the early Native Americans or others. There was some activity to the south and east with A. B. Feero and a few others who were penetrating the area with their logging efforts. To the north of Rabey was the Splithand community that was just getting started. Had there been no railroad through this country, the Rabey location would probably have been an extension of the Splithand area and may have only had a few farms at best. With the coming of the railroad, things changed dramatically. 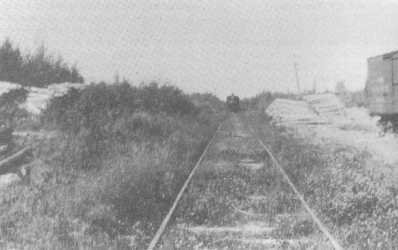 The Rabey Line Railroad was under initial construction in 1908, but it took a year or so to get the ties in, the rail laid, and a decent ballasting of the road. Even though the cost of the railroad was in the neighborhood of $200,000, it was built in the least expensive way possible. Only forty pound rail were laid down, and they were used rails besides. The railroad was needed to get out the products of the Hill City Pail Factory, which was the main shipper over the line. No doubt, the railroad was only planned to last for a few decades or until the timber from the surrounding countryside was cut. Pictured after they were moved to the Michelson Farm. There were big plans for Seaver. "W. H. Taylor and H. V. Eastman are planning on establishing a general store at Seaver, this side of the Mississippi River. They have a petition in to have the post office at Jacobson moved to Seaver. The store will probably not be established until spring." (Hill City News ~ November 21, 1912) The petition was denied. At that time, the farmers to the north and south of the line traveled along the high lands that led to Seaver and brought their produce to the station. The Seaver warehouse was the easiest way to get out the cash crops of potatoes and other grains and produce. While the Seaver warehouse had no agent or depot, the railroad made accommodations to serve the people of the area and get their produce to market. (Per letter from Pearl Michelson, dated October 5, 1996) The farmers of the region south of the grade and along the west side of the Mississippi River formed a co-operative and used the Seaver warehouse. They purchased a threshing machine and worked together to help each other and to try to improve their lot in life. In 1922, the farmers formed the Mississippi Threshing Company. It was started with 23 families signing up. They would hire a couple of men to run the threshers. The crew would move up and down the river to the respective farms changing the direction of the threshing each year. In 1928, 7,571 bushels were thrashed. In 1951, the company bought a tractor and the co-operative operated until 1956 when it was dissolved. Another society formed was the Farmers Hall Society, which then became the Farmers Social and Educational Society in 1921. There was, as well, the Jacobson Co-op. It was quite successful and eventually was separated from the Wawina Co-op and went on its own. The Store has an addition. Potato Warehouse is behind Depot. The depot at Rabey was built about 1909. A side track was placed on the south side of the main line. A railroad car was placed at Rabey to be used as a makeshift store. This was not satisfactory, and so Kaiser and Rabey built a general store of more substantial means that was finished in 1913. (Rabey History, by Sylvia Eckstrom) "At Rabey station, Chas. F. Kaiser and W. W. Rabey are putting up a building that will be occupied as a general store by V. R. Walker and Geo. A. Hankerson. Mr. Walker will be in charge of the store. The building, which is nearly completed, is 20 by 40 feet with 12 foot posts. A stock of general merchandise, groceries, dry goods, hardware, etc., will be carried in stock. The building will probably be completed in another week. Petitions are being circulated to have a post office established at this point. Trains were not the only mode of transportation over the railroad. 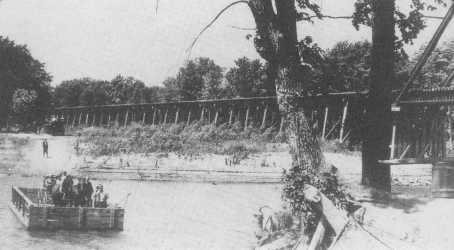 A number of people used the rails as a means of transportation by using "speeders" and motorized vehicles that would run on the rail. Sometimes they also met with disastrous results. "In a collision between a hand speeder and a railway motor Saturday evening, Mrs. Chas. F. Kaiser received a bad cut on her head and was rendered unconscious and the other passengers received minor bruises and were badly shaken up. "The 'motor' in charge of W. W. Rabey, had as passengers, Mrs. C. F. Kaiser and her sister-in-law, Mrs. J. D. Wilde, and was coming from Rabey to Hill City, endeavoring to get in ahead of the train. 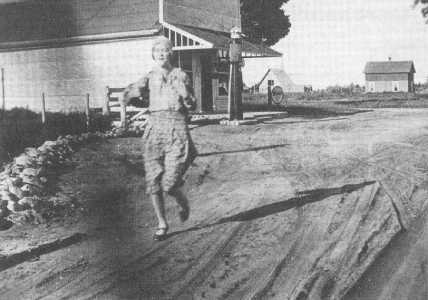 They were running at a good speed when they met the speeder ridden by E. E. Reynolds. In the darkness neither party saw the other until it was too late to avoid the smash-up. "Mr. Reynolds managed to get clear of his machine and escaped with a shaking up and some minor bruises. His speeder was badly broken up. Mr. Rabey had just time to shut off his power and put on brakes when the crash came. He escaped unhurt but the ladies were thrown a distance of fifteen feet. Aside from some minor bruises Mrs. Wilde was uninjured, but Mrs. Kaiser was not so fortunate. She struck her head, cutting a bad gash in it and was rendered unconscious. She was attended by Dr. Stewart and it was found that her injuries were not as serious as it was first feared. To the west of Rabey were a number of "spurs" or localities where pioneers were trying to take advantage of the railroad and the possibilities that were presented. Farmers moved into the area between Hill City and Rabey. Many tried farming, cutting timber to sell, or working for the various timber concerns. Heading west, the first place one came to was a place known as "Pierceville." This was a siding that was on the north side of the track and headed to the northwest a short distance. Not much is known about this except that the Pierce Brothers ran a lath mill there for a few years. (The Rabey Line, by Robert Lemen, page 13) The next place one came to was Washburn Lake or "Washburn." Here Art and Earl Heath had a lath mill that they operated a few years. It was sold to Sander Olson who moved the mill to the southeast side of Washburn Lake and ran it for a time. A little over a mile north of Washburn was the Lange School named for the family by that name. 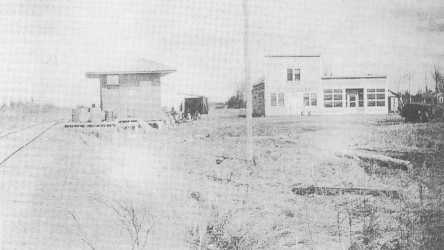 On the southwest side of Washburn Lake was the Taskey School named for that family. It was also known as the Allen Lakes School. Burt King is upper left with vest and tie. Nick Kortekaas is right with his hands folded. Neil Kortekaas is right of Nick with his eyes closed. Adjacent to the Martin Spur and to the west was the location called "Brauer." There was a spur here on the north side of the track heading west, and it was here that most of the development at Brauer occurred. 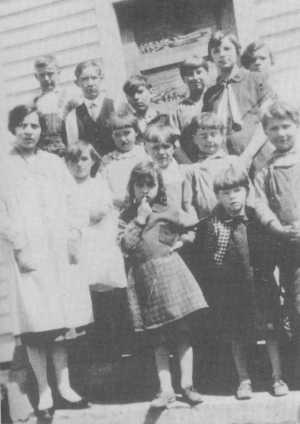 "Mrs. Harold Eastman and children made a trip to Hill City Thursday, returning the following day. 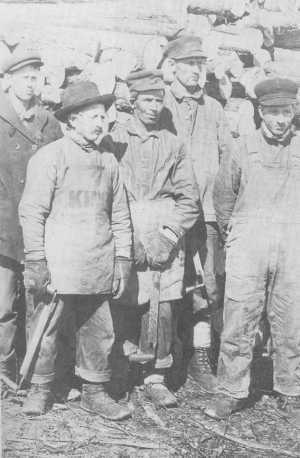 Mr. Eastman accompanied them as far as Brauer where he went to look after logging camps." 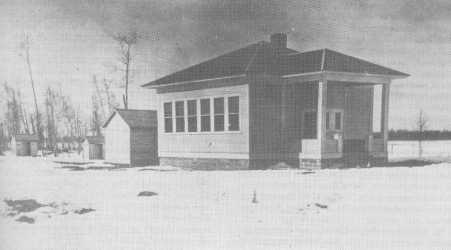 (Grand Rapids Herald Review ~ December 27, 1916) The Brauer School was on the north side of the tracks while a few miles to the south was the Huddleston School. 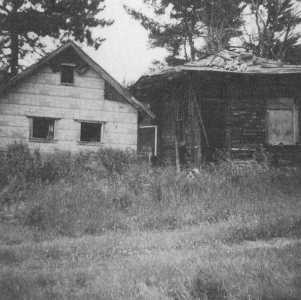 There was a general store in Brauer known as Jackman's Store. They carried the typical goods and also had boarders. This was the social center for the locality. The people tried to have a bit of fun whenever they could. "A big dance is scheduled by J. M. Jackman at Brauer Spur on Saturday, June 26." (Hill City News ~ June 24, 1915) One holiday went something like this. "Hill City was not the only place to celebrate the 4th in a fitting manner. It was also observed at Brauer's Spur by a neighborhood picnic at Little Pine Island, the summer home of Mr. and Mrs. W. B. Chase. An old fashioned picnic dinner was served, which wound up with ice cream, lemonade, etc. After dinner came the sports and races. "The nail driving contest was won by Mrs. J. Huddleston first, Mrs. Howard Anderson second, and Mrs. Otto Weidiger, third. The potato race was declared a tie between Otto Weidiger and Howard Anderson and a 50 yard dash was run to settle the matter. This was won by the former. John Pilgrim of Brauer won from Miss Jessie Milhouse of Minneapolis, in the potato peeling contest. In the tug of war between the farmers from Brauer and a crew from Minneapolis the farmers won after a hard tussle. 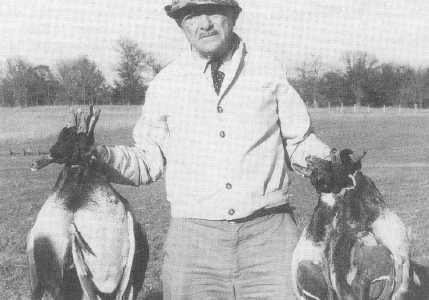 Two egg races were next in order, the first being won by Kenneth Chase, second won by Roy Huddleston. The bean guessing contest ended as follows: Otto Weidiger first, W. B. Chase second, Mrs. Howard Anderson third. Howard Anderson gave a reading and W. B. Chase a short talk and a story which were all greatly enjoyed. A sewing contest was won by John Pilgrim first and W. B. Chase second. John says that he knows a thing or two about sewing, having done the sewing for his house for some years. In the shooting contest W. B. Chase and J. Huddleston carried off the honors among the men while the ladies showed that when it came to hitting the mark with a gun they knew how it was done. Mrs. Otto Weidiger and Mrs. Howard Anderson won the shooting. A ball game went to the Minneapolis boys, after which the dance was started. The Brauer community did what they could for the Red Cross organization. "Another one of those jolly Red Cross socials will be given Saturday night at Jackman's Camp at Brauer. Brauer people have become locally famous for good times they have at their Red Cross dances and socials. Everyone is assured of a hearty welcome at the camp and a most enjoyable time. The evening will be spent in dancing and in having a general good time." (Hill City News ~ January 30, 1919) After Brauer, one went only about three miles and you were in Hill City. There were times when people would ride the trains either to Brauer where dances were held or else ride to Hill City for the same entertainment. The Farm Development Company opened up land all around the Rabey area and sold many lands to prospective buyers. 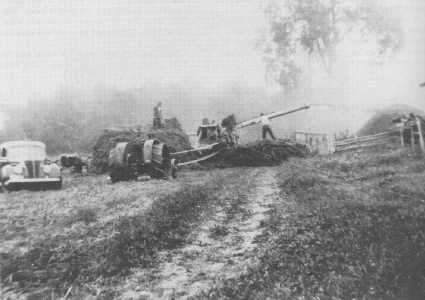 "W. W. Rabey and C. F. Kaiser have a crew at work clearing and breaking an 80 acre farm at Rabey. They have five acres in potatoes and will put in five more. The rest of the farm will be seeded to flax and tame hay. The Rabey-Kaiser project is the largest to be undertaken this year, but there will be many similar projects in the years to come." (Hill City News ~ June 13, 1912) The farmers had a tough go of it though as the farm lands near Rabey were low and difficult to drain even with the newly dug ditches that were draining off the area towards the Mississippi River. To the left are the toilets and woodshed. 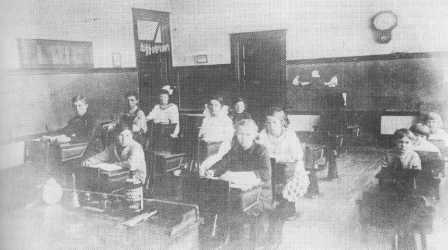 First and Second Grade teacher was Harriet Hoard. Third Grade teacher was Mrs. Magenson. By 1916, Rabey's prospects looked bright. One newspaper account relates. "A new hostelry has just been opened and has been given the name of 'Dew Drop Inn'. Mr. Robert R. Meer is proprietor, clerk and chambermaid as well as bottle washer and hostler. Mr. Meer reports that business is good and that he is furnishing as good grub as can be gotten in any place in the country which bears the same name. George Good, R. C. Rasmussen. The first postmaster appointed at Rabey was Vane Walker who started on March 21, 1913. Chas. Kaiser took over on August 21, 1914 with Harold Eastman taking over that duty on October 27, 1915. (Per U. S. Postal Service records) John Rice was the first rural mail carrier from Rabey. He would travel one day into the Splithand area and then the next day towards Jacobson. After Rice, Mr. Wandschneider carried the mail and then Joe Murphy. (Rabey History, by Sylvia Eckstrom) The mail came via the railroad which carried it on down from Swan River. By 1920, the people of Rabey and Splithand got together to organize a joint telephone company. 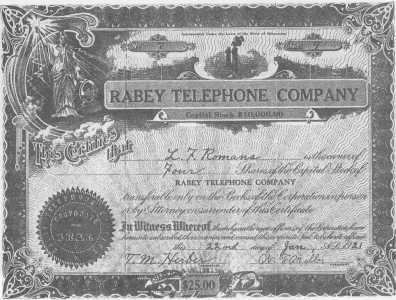 On January 1, 1921, the Rabey Telephone Company was officially organized. (Per Rabey Telephone Company bylaws, dated January 1, 1921) It is not known just what the exact service territory consisted of other than the immediate Rabey area and some distance into the Splithand country. Bylaws were set up, and the company ran for a number of years. Warren Rabey thought he had invented the ultimate stump pulling and land clearing machine. The machine was said to be able to clear from an acre and a half to five acres a day according to the number and size of the stumps, windfalls and standing timber. The cost per acre was only $13.77. The cables with which the pulling and skidding were done would reach 200 feet from the machine. Five men were required to operate the machine, one to control it, with two on the pulling cable and two on the piling cable. The nice thing about this machine was that the stumps could be piled up to 20 feet in height while the machine was still busy pulling stumps. Rabey proposed to organize a company to build the machines, sell them or lease or operate them on land clearing contracts. The machine could clear land quickly and cheaply. (Per brochure by W. W. Rabey, dated 1921) The demonstration of the Rabey stump puller and piler, staged by the inventor, county commissioner W. W. Rabey, about a mile south of Hill City, on Friday last, attracted a large number of people. There were probably three to four hundred who witnessed the work of the machine during the day. Delegations were present from Shovel Lake, Remer, Swatara, Grand Rapids and Virginia. " (Aitkin Republican ~ October 6, 1921) It is not known why the machine did not go into mass production, despite the demonstrations that were given. Eastman later sold his store to Amos K. Lukens in 1922. "Col Lukens has purchased a new 550 barrel gasoline storage tank and an up to date pump. These fixtures will soon be installed near the new store." (Hill City News ~ September 28, 1922) Lukens also ran the train depot for a few years. About 1920, Maurice Salisbury came to Rabey. 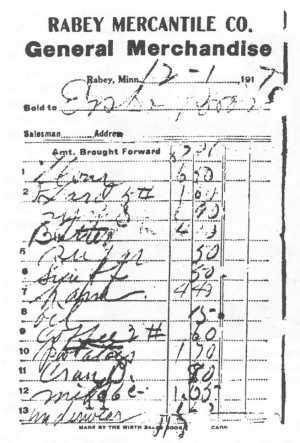 Salisbury first came to Aitkin where he worked as a bank teller. Salisbury then went to work at Ball Bluff where he worked at buying timber from the farmers of that locality. He saw an opportunity at Rabey and so he started running a pole yard there. He sold mining timbers to the mines and had them shipped out over the Hill City Railroad. Having established a good rapport with the farmers of the Ball Bluff area, he had a good following, and he treated them well in return. There was talk of establishing a bank at Rabey which interested Maurice. "A number of people in the southern part of Itasca County are interested in the project of a new bank, which it is proposed to establish in Rabey. The business men located in Rabey, and the farmers in the territory adjacent, have felt for some time that there was an opportunity for a bank in that village, and have made the necessary moves to get one started. "The hearing before the state securities commission will be held in St. Paul today. Several men from Rabey and Splithand are in St. Paul to attend the hearing, among them being H. V. Eastman, A. B. Feero, A. N. Phillips and William Jackson. They express little doubt of the approval of the project, and of securing the charter necessary before opening business. "James Annand, of St. Paul, recently visited in Rabey for several days with the view of becoming cashier of the bank, if it was established. He was very favorably impressed with the agricultural possibilities of the southern part of Itasca County, and the district tributary to Rabey, and declared his willingness to locate there." (Grand Rapids Herald Review--April 7, 1920) In those days banks were easy to get started as you needed only $10,000.00 capital and $2,000.00 surplus to obtain a bank charter. (The Rabey Line, by Robert Lemen, page 27) The state securities commission must not have been as upbeat about the location, as the charter was not granted to Rabey. About 1934, Maurice Salisbury went into business with Vietti (Vic) and Ole Mannila, who had a sawmill at Jacobson. Maurice was mainly a silent partner and provided financial help as well as business for the mill. Vic and Ole had a steam tractor to run the mill. This was the site where the power plant was set up for the mill and also for several businesses in Jacobson. They were their own electric company for a few years until the R.E.A. came to town. The Manilla boys bought out Maurice's interest in the mill and moved to Big Falls. (Per interview with Doug Salisbury on February 16, 1996) Maurice moved in 1937 to Grand Rapids and started buying timber for the Blandin Paper Company. One paper tells the story of the progress that Rabey was making. "Rabey is located on the Hill City line twelve miles east of Hill City and 19 miles south of Grand Rapids. While still comparatively new, ten years ago a forest stood on the present town site and there were no roads of any kind leading to it. The quality of the land in and about Rabey and the ease with which it could be cleared and placed under plow induced many land seekers to establish themselves in that locality and has resulted in the building up of a prosperous farming community with a very promising future. "I. P. Best of Davenport, Iowa, the largest active landholder in the community has some 1,800 acres which is rapidly being improved and when the time comes will be placed upon the market. Mr. Best is now placing under plow the entire east side of section eight just west of Rabey and plans to have a field some over a mile in length extending across this section and into the section joining it on the north. This in addition to improvements on other portions of his land in vicinity. "A fine modern hip-roof barn has been erected this summer in 'Village View Farm' owned by M. J. Salisbury which is located just a quarter mile north of Rabey. "Farmers in the Rabey neighborhood are all active getting more land under cultivation and making general improvements to their farms and it is not difficult to predict that a very few years will see a material advance in the prices of farms located there. Charles and Amy Porter moved to a farm near Rabey in 1934. Amy started a club called the "Rabey Helping Hand Club." This club was like a sunshine club and did whatever they could to make people feel welcome in the community. In 1944, the state health department wanted the local school board to put down a well and install inside plumbing. The school board at that time consisted of Jake Nordberg as clerk, Lee Feero as treasurer, and Victor Bjorkquist as chairman. The board didn't feel the district could afford the costs of the work needed and so the school was closed. 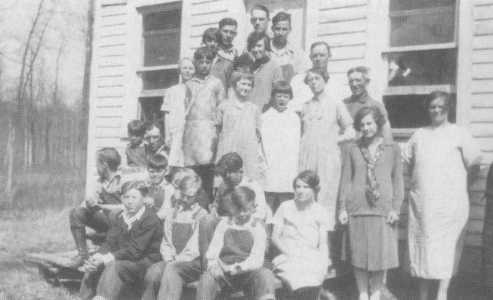 (Per Rabey History, by Sylvia Eckstrom) The school house was sold to Earl Lipscy of Hill City in 1950. Earl sold the building to Harold Mento who tore the building down and built a home out of it on the River Road. Still another fire destroyed a part of Rabey. "Early morning fire completely destroyed the store building and stock belonging to John Thiel at Rabey. Cause of the fire was not learned but it appeared to have started in the front part of the store at about two o'clock in the morning. "At 2:30 a call fro help came to the forestry office and a crew was hurriedly summoned and they went to the scene of the fire as quickly as possible. However, the fire had got such a start and the building burned so fast that very little could be done in salvaging any of the contents of the building or putting out the fire so as to save the building. When the state decided to improve Highway #34 (200) in the 1950's, they built the road right through the town site of Rabey. The state bought up the houses that were in the way and then resold them to people who moved them out of the way. The last building to go at Rabey was the potato warehouse. The building eventually collapsed from heavy snow one winter. Warren Porter then burned the building to prevent anyone from being hurt in the ruins. Today the average traveler would not notice the former site of Rabey as having been a place of importance. All that remains is the old Nels Hyen farm on the south side of Highway 200. The railroad is gone and is now used as a popular snowmobile trail in the winter. A few farms still exist to the north as one travels towards the Splithand country. Nature is reclaiming many of the farms that existed near Rabey. The village of Rabey served its purpose in a simpler and more peaceful time. The memories live on and as one passes through, a bit of nostalgia sweeps along as we remember the pleasant days of Rabey.